Tuesday oh how happy I am to see you. Yesterday was a rough day to say the least. Aubriella came back from being at her fathers all weekend, she was over tired and doesn't want to go back to listening to our rules (this happens every time). Austin wanted his sister who wanted nothing to do with him. Plus Brian was working a 13 hour day. It is like the kids are always a million times worse when dad isn't home. But today is a new day. Not much planned but hopefully some fun and relaxing. 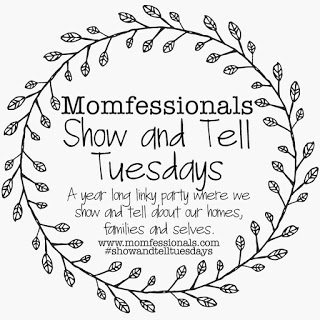 It's that time again for Show and Tell Tuesdays with Andrea from Momfessionals. This weeks topic is Serving Others. At first I was thinking of skipping this time. I didn't think that I really serve others. Then I sat here and thought of all the little ways that I help. I'm not sharing how I help Serve Others to brag by any means. I am sharing to show that even the little things make a difference. I use to think I was unable to serve others properly because I have never attended church. There are so many other ways to serve and help others. Even ways that don't take too much time or money. Last week I found a babysitter for Austin (thank you Mom) and volunteered to help at the COSI on Wheels science day. Every few months I also help as a "Milk Parent" selling different snacks during lunch time. In the Spring I am co-chair for their annual Ice Cream Social for the community. I have also donated baked goods, ice, and food for different events where I couldn't give my time. Every year different events we already are planning on going to take non-perishable food donations. We always donate a few cans of something. Even the little things matter. If we see trash laying on the ground when we are on a walk we will pick it up and throw in the bottom of the stroller then in the garbage when we get home. Who doesn't already shop on Amazon. If you use https://smile.amazon.com/ a small donation go to an organization of your choice. It doesn't cost you anything different, your prime still works. Our donations goes to Ella's school PTA. You hear stories on the news or on Facebook of someone buying the order for the car behind them in line at the drive thru. It is a little something you can surprise a random stranger with. You could be making someones day who just lost a loved one, had a bad day at work, or just needs a little pick me up. When I use to work at Dunkin Donuts I was surprised how often this happened and how often the trend kept up with each person paying for the car behind them. How often do you go through the checkout at your grocery store, hair salon, or Walmart and they ask if you want to donate to a certain cause. I always donate at least $1. It all adds up. This year our Daisy Girl Scout Troop is donating socks to a local shelter. With each sock donation they will make a Christmas card to give with the sock. Any left over Christmas cards will be donated to Meals on Wheels. Instead of throwing out good clothes, toys, household items, etc. We donate all our items to Volunteers of America. These are all great ideas, and I love that you sat and thought about how you serve others. Everyone probably does it but you don't always realize it. Plus, I like getting new ideas of how to help people out or give back somewhere.